A perfect arrangement of art and objects, found at The California Workshop. Photo by Nina Freudenberger. When arranging art in your home, we know it's easy to get stumped. So we've rounded up our favorite ways to create a traditional gallery wall using items that are already in your home! By combining art and objects, the resulting look is rich, layered and anything but basic. Here's how. Yes, you read that correctly--intentional obstructions! Try placing a large piece--such as a lamp, plant or sculpture--in front of an existing gallery wall to add depth and spark a bit of curiosity. Treating your lighting as a work of art can help the design of a room feel more cohesive. In the example above, the pink and gold sconce is spaced an equal distance from the art so that it feels like it's a part of the art grouping. Below, the decorative ship chandelier adds a sculptural element to the room and complements the antique artwork. Photo by Brittany Ambridge for Surf Shack. 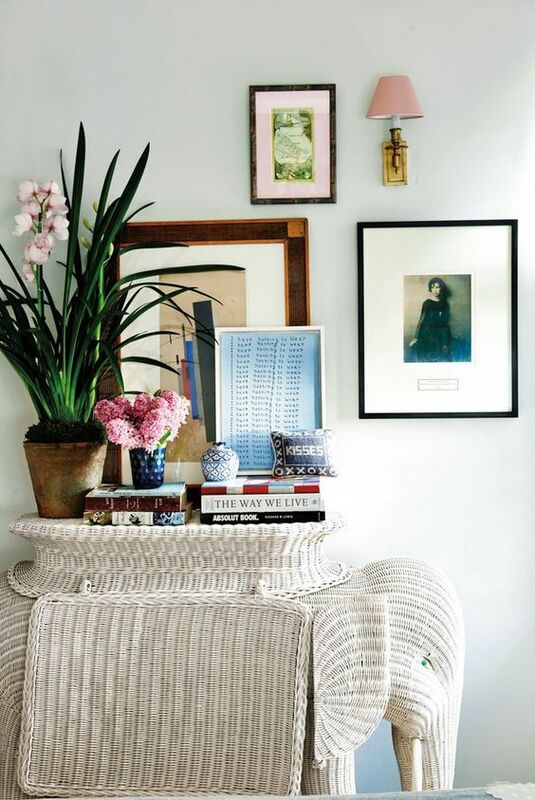 Visually balance a display of art by using items found in your home. In the photo above, the baskets, antlers and surf board create a focal point for the black and white photo in the middle. In the example below, the two yellow chairs help highlight a special piece above. Photo by Douglas Friedman for Domino. Photo by Annie Schlechter for Domino. Above, editor Tori Mellott uses art to create symmetry and balance with the objects in her home. Art and objects work in harmony in our example above, as a streamlined grouping of art unifies a busy wall of books. Photo by Jenny Gage and Tom Betterton via Domino. Nothing adds life to a room quite like plants! So including them in your gallery wall is a fresh take on a traditional display. Photo by Skye Parrott via Domino. Round out your gallery wall with a mirror. (Or even a few!) The reflective surface acts as a nice breather in a crowded art wall, and can offer a new shape to the overall composition.